The seller of today’s Nice Price or Crack Pipe Jag says it’s owned by an ‘eccentric 81-year old family friend.’ I guess that’s a good way to describe someone who’d have a Jagamino. Let’s see if it is eccentrically priced too. It seems as though the sun will never set on the British Empire, what with today’s Jag following right after last Friday’s 1995 Range Rover County. Unfortunately for the seller of Friday’s standard bearer of English Country stiff upper lipness, the general consensus was to say goodnight moon at any price, and it went down in a 70% Crack Pipe loss. Perhaps today’s Jag will reclaim the throne. Okay, here’s a group activity: think of all the cars out there that have been modded for someone’s individual taste or proclivities. Now, think of all of those that have been done with a level of polish so that they don’t look like hack jobs. Now, out of that group think of the ones you might actually want to own. I can think of a few out there. Bill Harrah’s Ferrari-powered Jeep being one of them. And perhaps Jay Eitel’s Jag V12-powered Corvair as well. Those are two that I’ll bet most of us would agree are pretty lust worthy because of their unique modifications. Let’s see if this odd bodkin of a Jag fits that mold as well. 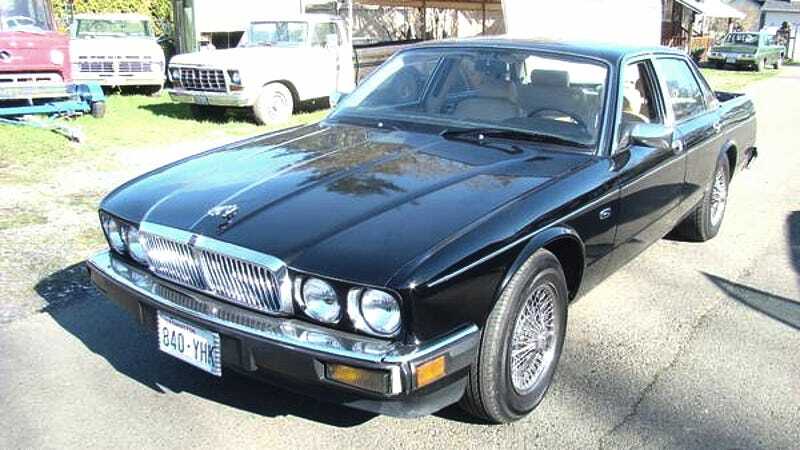 This car started out as your run of the mill XJ40 - the mid-‘80s replacement for Jag’s long-serving and quite lovely to look at XJ which was built from ’69 through ’92. The XJ40 was a vastly simpler car to produce than its predecessor having a quarter-fewer body panels and more modern mechanical systems. It was not however, all that lovely to look at. This one may not have had its looks improved, but it certainly will get noticed. That’s because the boot lid and standard saggy rear end has been unceremoniously replaced whole hog with the back end off an ‘80s El Camino. Actually, I don’t know that for sure. There might have been a ceremony involved. Why would anyone do this? Who knows, but the end result is amazingly professional in its presentation. The tail gate looks to be functional and the bumper and lights are an odd echo of the Jag originals. The bed has been tough-coated and comes with a tonneau to cover all your secret squirrel stuff when needed. The specs on the rest of the car are equally laudable. It comes with just 17,500 on the clock and presents itself well in the pics. The front bumper has been scraped on the driver’s side corner, but take it from me, the junkyards are full of these cars so that part should be easy to fix. There are some issues with the wood inside as well, but at least it has wood inside. The only significant issue with the overall presentation is the choice of wire wheels which are a little pimptastic if you ask me, which you didn’t. The seller says that the AJ6 under the bonnet runs great and that it’s ‘one of the more reliable Jaguar motors.’ That’s sort of like saying Larry Fine was one of the more emotionally stable Stooges. Of course it has the ZF four-speed with Jag’s weird J-gate backing up the DOHC 3.6-litre six. According to the ad health issues are driving the sale. This car is apparently part of that eccentric owner’s broader collection, and maybe he’s sick of looking at it. Being in a collection could explain the condition and the lack of miles. That lack of use however could spell trouble down the road for things like seals, rubber, and plastics. Maybe this custom will simply go to another collection were it will be appreciated for its unique aesthetics and not it’s utility. To do so will apparently cost $8,999. Now, keep in mind that a non-El Camino’d XJ6 of this era would normally set you back… oh, I don’t know probably nothing as I think people abandon them on other people’s doorsteps just to be rid of them. There’s just not a big market for non-El Camino’d XJ6s. Do you think there’s much of a market for this one that is rocking an El Camino booty? Further more, do you think that market might support its $8,999 asking price? Or, for that price, is this custom Jag just not all that collectable?